On April 17, 2013, an explosion at a fertilizer plant forever changed the community of West, Texas. Richard Mangum, Texas Baptist church strategist for Central Texas, was in the town talking with local pastors and helping assess needs in the area within a few hours of the disaster. As a church strategist, one of Mangum's primary responsibilities is to connect with local pastors and help them in times of need. By being on the scene quickly after a disaster, strategists like Mangum can be the serving hands of Texas Baptists and help communicate needs to a broader audience. Several of the strategists have had the same opportunity to respond to tornadoes, flooding and other disasters. "If there is a need, we are the front guys," said Larry Vowell, director of church strategists. "We connect churches to Texas Baptists. With backgrounds in church growth, ministry and development, our church strategists are invaluable connectors to local pastors and associations. We try to help churches that are plateaued or declining and churches that are dealing with problems. Our strategists have been trained in some processes they can use to help these churches." 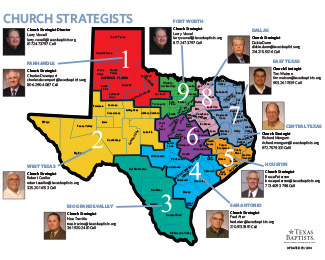 Currently, there are nine church strategists that live and work in regions across the state of Texas. Two new strategists have recently joined the team: Noe Trevino, serving the Rio Grande Valley, and Tim Watson, East Texas. 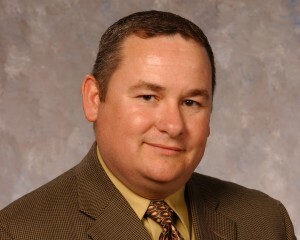 Charles Davenport is the strategist in Northwest Texas; Fred Ater, San Antonio; Bruce Peterson, Houston; Robert Cuellar, Southwest Texas; Dickie Dunn, Dallas and Vowell, Fort Worth. 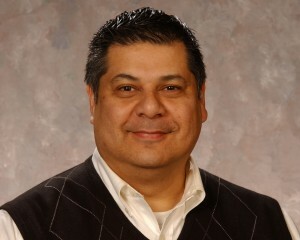 "Our job is to all about relationships," said Robert Cuellar. "It is about sharing resources, facilitating, intervening, walking alongside pastors and lay leaders. I count it a blessing to be a part of this ministry." Texas Baptists Executive Director Dr. David Hardage has asked the strategists to build relationships with pastors and churches and help communicate what Texas Baptists are doing in ministry to those in their areas. When churches lose a pastor, church strategists come alongside to connect the church with resources. If a pastor is going through a difficult time and needs to share needs and concerns, their local strategist is available to help. If a church is needing training or help in facing the future, the strategists are available to walk with the church through that time in their church's life. "I have talked with pastors who just needed someone to listen to their struggles," Mangum said. "If you are looking for a safe place, I can be a safe place in the midst of crisis." One of the biggest needs that the strategists have tried to address is helping pastors find friends. Twenty-five mentors were trained last year to lead groups of pastors in conversation. Additionally, 30 small groups, known as Pastors Clusters, have been created across the state who meet together over lunch once a month to talk and develop relationships with other pastors in the group. Beyond responding to personal and church crises, each strategist is also a certified Point Man through Texas Baptist Men, which provides them with the skillsets necessary to respond in the midst of disaster situations. Strategists are often some of the first on the scene, in situations like the explosion in West, and connect with churches and ministers in helping respond and meet the needs of people affected by disasters. Strategists also help connect churches with Texas Baptist ministries and resources ranging from missions and evangelism to counseling services and education and discipleship tools.